Today was a somber-joyous day in Rome. The Holy Father, Pope Benedict XVI gave his final Papal audience in front of over 200,000 people jammed in St. Peter's Square. Many of them were young people. Twitter had St. Peter's Square, Rome and Pope Benedict XVI trending for most of the day. The Pope said he did not come off the cross explaining that he did not give up or quit. Some criticized him claiming that he did not "carry" his cross like Pope John Paul II who suffered till the end. Each Pope has a different charism. Pope Benedict XVI also stated that he is not returning to a "private life," but will continue to serve the Church via prayer and study. Like the Apostle Paul in the biblical text that we have heard, I feel in my heart the paramount duty to thank God, who guides the Church and makes her grow: who sows His Word and thus nourishes the faith in His people. At this moment my spirit reaches out to embrace the whole Church throughout the world, and I thank God for the “news” that in these years of Petrine ministry I have been able to receive regarding the faith in the Lord Jesus Christ, and the charity that circulates in the body of the Church – charity that makes the Church to live in love – and of the hope that opens for us the way towards the fullness of life, and directs us towards the heavenly homeland. I feel I [ought to] carry everyone in prayer, in a present that is God’s, where I recall every meeting, every voyage, every pastoral visit. I gather everyone and every thing in prayerful recollection, in order to entrust them to the Lord: in order that we might have full knowledge of His will, with every wisdom and spiritual understanding, and in order that we might comport ourselves in a manner that is worthy of Him, of His, bearing fruit in every good work (cf. Col 1:9-10). At this time, I have within myself a great trust [in God], because I know – all of us know – that the Gospel’s word of truth is the strength of the Church: it is her life. The Gospel purifies and renews: it bears fruit wherever the community of believers hears and welcomes the grace of God in truth and lives in charity. This is my faith, this is my joy. When, almost eight years ago, on April 19th, , I agreed to take on the Petrine ministry, I held steadfast in this certainty, which has always accompanied me. In that moment, as I have already stated several times, the words that resounded in my heart were: “Lord, what do you ask of me? It a great weight that You place on my shoulders, but, if You ask me, at your word I will throw out the nets, sure that you will guide me” – and the Lord really has guided me. He has been close to me: daily could I feel His presence. [These years] have been a stretch of the Church’s pilgrim way, which has seen moments joy and light, but also difficult moments. I have felt like St. Peter with the Apostles in the boat on the Sea of ​​Galilee: the Lord has given us many days of sunshine and gentle breeze, days in which the catch has been abundant; [then] there have been times when the seas were rough and the wind against us, as in the whole history of the Church it has ever been - and the Lord seemed to sleep. Nevertheless, I always knew that the Lord is in the barque, that the barque of the Church is not mine, not ours, but His - and He shall not let her sink. It is He, who steers her: to be sure, he does so also through men of His choosing, for He desired that it be so. This was and is a certainty that nothing can tarnish. It is for this reason, that today my heart is filled with gratitude to God, for never did He leave me or the Church without His consolation, His light, His love. At this time, however, it is not only God, whom I desire to thank. A Pope is not alone in guiding St. Peter’s barque, even if it is his first responsibility – and I have not ever felt myself alone in bearing either the joys or the weight of the Petrine ministry. The Lord has placed next to me many people, who, with generosity and love for God and the Church, have helped me and been close to me. First of all you, dear Brother Cardinals: your wisdom, your counsels, your friendship, were all precious to me. My collaborators, starting with my Secretary of State, who accompanied me faithfully over the years, the Secretariat of State and the whole Roman Curia, as well as all those who, in various areas, give their service to the Holy See: the many faces which never emerge, but remain in the background, in silence, in their daily commitment, with a spirit of faith and humility. They have been for me a sure and reliable support. A special thought [goes] to the Church of Rome, my diocese! I can not forget the Brothers in the Episcopate and in the Priesthood, the consecrated persons and the entire People of God: in pastoral visits, in public encounters, at Audiences, in traveling, I have always received great care and deep affection; I also loved each and every one, without exception, with that pastoral charity which is the heart of every shepherd, especially the Bishop of Rome, the Successor of the Apostle Peter. Every day I carried each of you in my prayers, with the father's heart. I wish my greetings and my thanks to reach everyone: the heart of a Pope expands to [embrace] the whole world. I would like to express my gratitude to the Diplomatic Corps accredited to the Holy See, which makes present the great family of nations. Here I also think of all those who work for good communication, whom I thank for their important service. At this point I would like to offer heartfelt thanks to all the many people throughout the whole world, who, in recent weeks have sent me moving tokens of concern, friendship and prayer. Yes, the Pope is never alone: now I experience this [truth] again in a way so great as to touch my very heart. 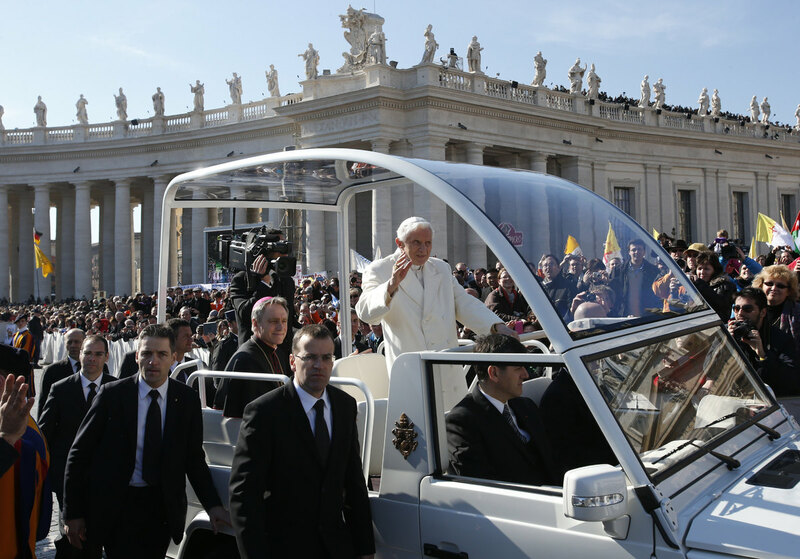 The Pope belongs to everyone, and so many people feel very close to him. It’s true that I receive letters from the world's greatest figures - from the Heads of State, religious leaders, representatives of the world of culture and so on. I also receive many letters from ordinary people who write to me simply from their heart and let me feel their affection, which is born of our being together in Christ Jesus, in the Church. These people do not write me as one might write, for example, to a prince or a great figure one does not know. They write as brothers and sisters, sons and daughters, with the sense of very affectionate family ties. Here, one can touch what the Church is – not an organization, not an association for religious or humanitarian purposes, but a living body, a community of brothers and sisters in the Body of Jesus Christ, who unites us all. To experience the Church in this way and almost be able to touch with one’s hands the power of His truth and His love, is a source of joy, in a time in which many speak of its decline. In recent months, I felt that my strength had decreased, and I asked God with insistence in prayer to enlighten me with His light to make me take the right decision – not for my sake, but for the good of the Church. I have taken this step in full awareness of its severity and also its novelty, but with a deep peace of mind. Loving the Church also means having the courage to make difficult, trying choices, having ever before oneself the good of the Church and not one’s own. Here allow me to return once again to April 19, 2005. The gravity of the decision was precisely in the fact that from that moment on I was committed always and forever by the Lord. Always – he, who assumes the Petrine ministry no longer has any privacy. He belongs always and totally to everyone, to the whole Church. His life is, so to speak, totally deprived of the private sphere. I have felt, and I feel even in this very moment, that one receives one’s life precisely when he offers it as a gift. I said before that many people who love the Lord also love the Successor of Saint Peter and are fond of him, that the Pope has truly brothers and sisters, sons and daughters all over the world, and that he feels safe in the embrace of their communion, because he no longer belongs to himself, but he belongs to all and all are truly his own. The “always” is also a “forever” - there is no returning to private life. My decision to forgo the exercise of active ministry, does not revoke this. I do not return to private life, to a life of travel, meetings, receptions, conferences and so on. I do not abandon the cross, but remain in a new way near to the Crucified Lord. I no longer wield the power of the office for the government of the Church, but in the service of prayer I remain, so to speak, within St. Peter’s bounds. St. Benedict, whose name I bear Pope, shall be a great example in this for me. He showed us the way to a life which, active or passive, belongs wholly to the work of God. I thank each and every one of you for the respect and understanding with which you have welcomed this important decision. I continue to accompany the Church on her way through prayer and reflection, with the dedication to the Lord and to His Bride, which I have hitherto tried to live daily and that I would live forever. I ask you to remember me before God, and above all to pray for the Cardinals, who are called to so important a task, and for the new Successor of Peter, that the Lord might accompany him with the light and the power of His Spirit. Let us invoke the maternal intercession of Mary, Mother of God and of the Church, that she might accompany each of us and the whole ecclesial community: to her we entrust ourselves, with deep trust. Dear friends! God guides His Church, maintains her always, and especially in difficult times. Let us never lose this vision of faith, which is the only true vision of the way of the Church and the world. In our heart, in the heart of each of you, let there be always the joyous certainty that the Lord is near, that He does not abandon us, that He is near to us and that He surrounds us with His love. Thank you!